In Afghanistan steht die nächste NATO-Offensive bevor. Dieses Mal lautet das Ziel Kandahar und es dürfte allen Beobachtern klar sein, dass dies kein Vergleich zur Offensive "Muschtarak" in der Provinz Helmand, rund um die Ansiedlung Marjah, sein dürfte. Zudem der bisherige Erfolg noch nicht absehbar ist. Schon jetzt demonstrieren die sogenannten, sehr bedeutenden Quetta Shura Taliban, welche sich unmittelbar dem Taliban-Gründer Mullah Muhamad Ommar unterstellt fühlen, in ihrer Hochburg Stärke. Vor zwei Wochen starben mindestens 35 Menschen bei mehreren Detonationen. Bisher vernachlässigten Armee und Polizei die Provinz und ermöglichten den Taliban Kandahar-City zu kontrollieren und als Ausgangsbasis zu benutzen. Dies soll sich nun ändern. ISAF operations in late 2008 and early 2009 did not have lasting effects on the enemy system in Kandahar. 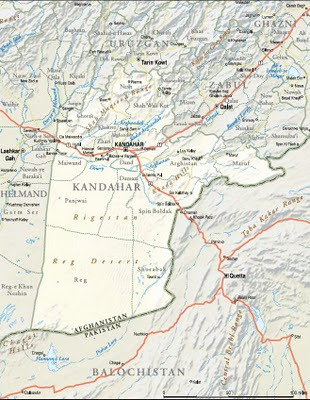 Given the short duration of ISAF operations, Taliban fighters could easily move to safe havens several kilometers from where ISAF operated and return to their original location on the same day that the operation concluded. ISAF’s failure to protect the population in these areas left local villagers under the control of Taliban intimidation and governance. Unable to establish a sufficient presence to separate the local population from Taliban intimidation, ISAF suffered from limited intelligence about insurgent activities. Die Empfehlungen sind etwas hilflos, gleichen sie sich doch immer. Mehr Männer, mehr Ressourcen, größeres Engagement. Größerer Erfolg? Defeating the Taliban–or at least destroying it –requires more Coalition and Afghan forces in Kandahar Province. If ISAF does not generate sufficient force densities in critical areas, its attempted counteroffensive will culminate, giving enemy fighters a permissive environment and allowing Taliban terror to continue in Kandahar City. Without sufficient resources, local leaders will continue to fear the Taliban and see the insurgency as ascendant in Kandahar. ISAF cannot simply protract the conflict to hand responsibilities to the ANSF . The population may eventually decide that a Taliban victory is preferable to a drawn out conflict in which ISAF buys time, but demonstrates no intention to win.